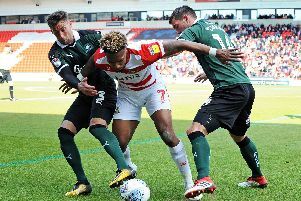 An Andy Williams with a point to prove could be a major asset for Doncaster Rovers next season. That is the verdict of Darren Ferguson following his surprising u-turn in removing striker Williams from the transfer list. After missing out on two or three forwards earlier this summer, Ferguson determined retaining Williams was his next best option, particularly with the positive manner with which the 30-year-old returned for pre-season training. Not only will the striker be determined to prove Ferguson right this season, he is also in the final year of his contract meaning his performances will go a long way to determining his future. “The thing with Andy is he’s always done well when he gets into the final year of his contract,” Ferguson told The Star. “Whether that is a coincidence or not I’m not sure but it is a fact. “In the last year of his contract at Swindon, it was his best season. He got 22 goals that year. “He’ll have the motivation to prove a point, have motivation to get a new contract, perhaps that will help him. “I’m delighted he’s staying. He’s never given us a moment’s trouble. He’s a great lad. “He understood the situation and the finances of his contract was part of it as well.